Just finished rejuvenating the 415M I bought on eBay ($95). All that's left is to install the speakers, as soon as I decide which ones to use. How much did you have replace/redo? 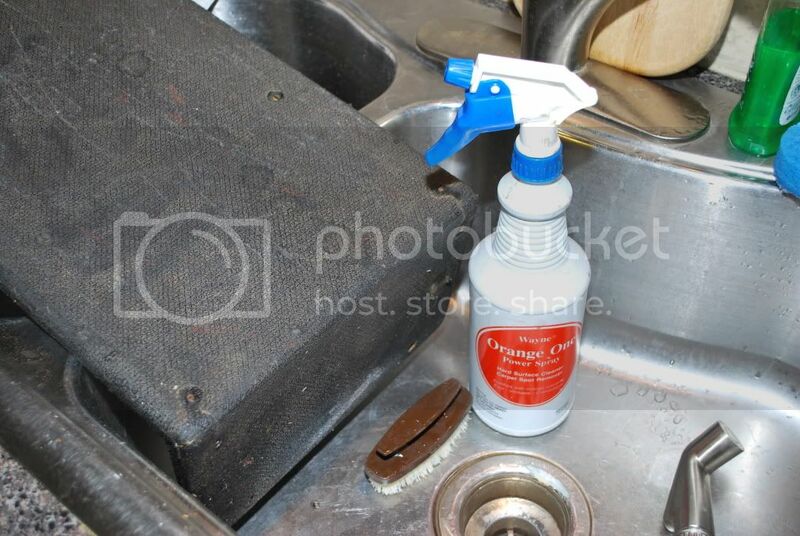 Tolex, grill cloth, corners, feet, handle, wheels ? Cab was pretty decent, mostly scratches and nothing too deep. One or two tears were in the Tolex, but a dab of medium CA got the frays down. Corners are new from Conrad, and I polished them with white compound on a dual buffer. Large rubber feet are also new from Conrad. I always replace all my fasteners (screws, washers, nuts) with stainless steel parts, also polished to a chrome-like gloss on my buffer. Handles are original, and I polished the caps after treating them with Naval Jelly to remove most of the surface pitting. The previous owner had already replaced the casters with common 2-inch parts. I just cleaned and polished them. The grille was dirty, but otherwise in great shape. It didn't match the material I got from Conrad and I want all my pieces uniform, so I installed new cloth. If anyone out there is that much of a purist, I have the original grilles for the 415M, 215 cab and two accessory horns available. The 200S grille is here too, but it had been painted black. I got the paint off, but the cloth underneath the paint is dull and lifeless -- not very good as an original replacement. Here is my Tolex cleanup procedure on a pretty rough Coliseum Slave case. 1. Remove the chassis, and strip the case of any hardware and fasteners. 2. Remove any paint, nail polish or other markings with lacquer thinner and a toothbrush. 3. Alpha-cyanoactrylate (CA) adhesive and accelerator are ideal for nailing down any frayed cloth. Good CA is like Crazy Glue that actually works. 4. Orange One is a commercial cleaner. Wet the surface with Orange One. Fantastik or similar cleaners are also okay in a pinch. 5. Scrub deeply in all directions. Work the cleaner into the crevices. Rinse off the cleaner with plain water, and dry with a lint-free towel. 5. 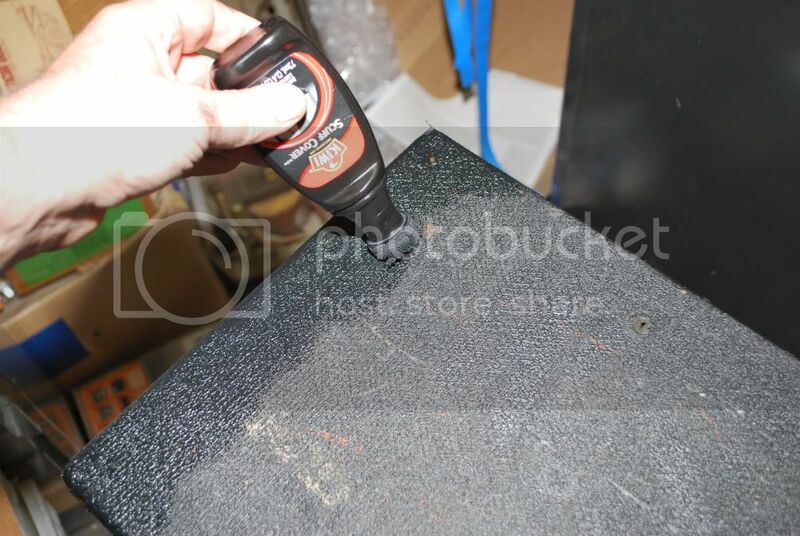 Coat the entire Tolex surface with Kiwi Liquid Shoe Polish. Use a very wet coating, and rub the polish in with a soft cloth. 6. 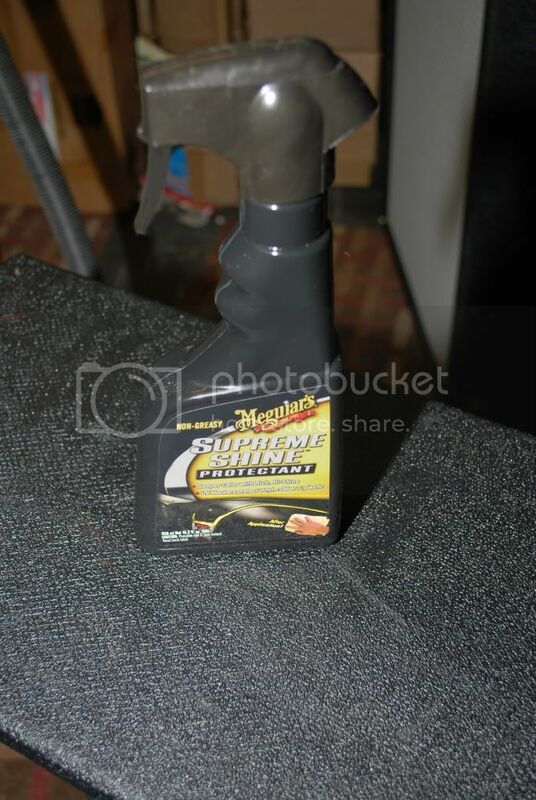 When the polish is dry, use Meguire's Protectant to seal and gloss the surface. Use the soft cloth again to smooth and spread the sealant before it dries. My advice is to NEVER use Armor-all (sp?) on anything you value. 7. This is my rejuvenated Concert Controller 1. 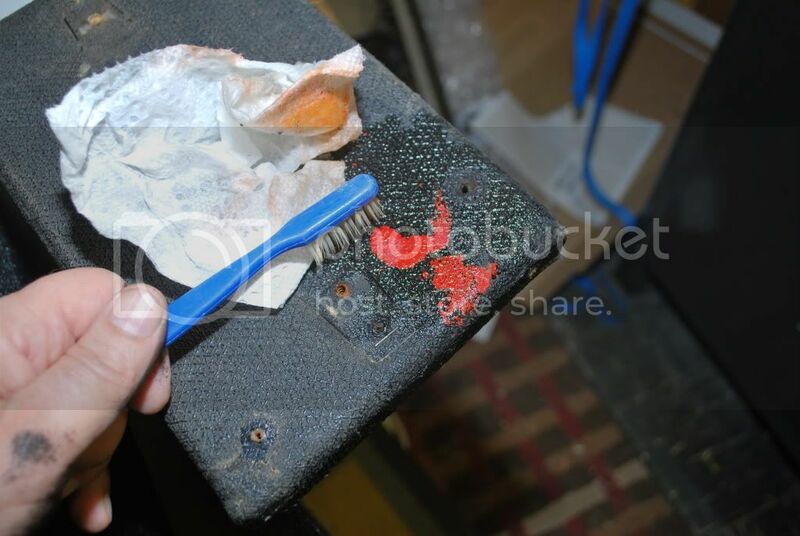 The Tolex was restored using the described method. 8. My 1974/5 Fender Twin Reverb received the same treatment, but the covering is new Sunn Tolex. The Armstrong 6-string is made from genuine vintage-60's Armstrong parts. An original guitar body was unavailable, so I used a bass body. Looks great, Jeff. Where did you find the Orange One? I can barely find the product and can't find any vendors for it on the internet. Thanks. Sorry to take so long getting back. My source is personal, so I had to clear giving out his private line before I posted anything. Cost is very reasonable at $4.55 per quart or $54.10 per case of 12, plus shipping from Ft. Wayne, Indiana 46815. Contact Mark Erpelding at 260-410-1053 or e-mail to merpelding@janitorssupplyco.com. Thanks! I'll contact him Monday. Still adding to the Sunn pile, and having each chassis teched while I do the cosmetics. Working on another pair of 412SR columns and matching Concert Horn Accessory units - still up in the air. I love my old Fender JBL Twin Reverb, so I'm keeping that one, as well as my brother's not-so-old Marshall VS100R combo amp (1x12) and 410A cabinet. Both amps have personal history. Came into a pretty slick set of Alesis DX5 electric drums, which should do well in the basement for practicing in a tight area. Also bought a few new SM-58 mics, solid-base floor stands and 6-inch goosenecks. The gooseneck is a great way of eliminating those ridiculous boom arrangements on a tight stage - gets the mic right in your face, but a lot cleaner and nothing to adjust or come undone. Working on cleaning out the basement room next to my model workshop. Small, but should make a decent practice room. The Alesis drum kit will help keep thing clean. I'll post more images when things are moving along more quickly. Having fun every day. Found a pretty hot guitar player nearby, and did a couple of open mic nights. Not exactly giggin', but I got to sing and play in front of an audience again after almost 20 years. Felt good singing Zevon, Cream, Dylan and few others after so long. Cool! you're building a Sunn museum there...haha! I which to buy my 1st house, it will need a basement with soundproofing and everything...live for music! Hey do you have any pictures of the 415 without the grille on? I'm trying to construct my own, I'm tired of hauling 2 2x15's with me everywhere, and I have a couple of spare Sunn bass transducers, though one needs a dustcap. The wife is OK with me adding more speakers to a current cab, but not with me buying any more, sigh. Mainly I'm trying to figure two things. 1. Does the v baffle connect to the back of the cab or is there a gap between the two sides. 2. How is the bottom port constructed. Shame there's not a catalog in the Sunn Museum that covers the 415, those line drawings are kind of handy. Here's a photo of the front, at least. I'll get more pics of the cabinet for you. Another member asked me to measure out the cabinet. When I do it, I'll post an image here with dimensions. Maybe that will help you. The V-baffles do hit each other, but not at the very back of the cabinet. The juncture is roughly 1-2 inches ahead of the back, and there is a vertical piece of strip wood between the back and the V intersection. This strip has slots for the wire harness to pass from right to left and top bottom. I still have one speaker out of the cab, so I can take some shots of the interior for you. Should be a day or two, depending upon how much lagging I'm into or how many new Sunn grilles I feel like mounting. Might even work on an airplane. CLD, thanks very much, that at least clears up the port question looks like slots cut in the baffles, with a cross piece mounted above them to act as a horn mouth. Jeff, that is very useful, sounds like it's almost like a frame that is slotted into the cabinet. I always wondered how they ran the wiring from one side to the other in my 612S, but never thought to measure it when I had it. I'll look forward to seeing your annotated photos. If anyone is in Florida I noticed one for sale.